During the war, submarines of the United States Navy were responsible for 55% of Japan's merchant marine losses; other Allied navies added to the toll. The war against shipping was the single most decisive factor in the collapse of the Japanese economy. Allied submarines also sank a large number of IJA troop transports, killing many thousands of Japanese soldiers and hampering the deployment of IJA reinforcements during the battles on the Pacific islands. They also conducted reconnaissance patrols, landed special forces and guerrilla troops and performed search and rescue tasks. The majority of the submarines involved were from the U.S. Navy, with the British Royal Navy committing the second largest number of boats and the Royal Netherlands Navy contributing smaller numbers of boats. While Britain stationed a force of submarines in the Far East prior to the outbreak of war, no boats were available in December 1941. The British had 15 modern submarines in the Far East in September 1939. These submarines formed part of the China Station and were organised into the 4th Flotilla. Although the number of British submarines in the Far East increased in early 1940 when the 8th Flotilla arrived at Ceylon, both flotillas and all their submarines were withdrawn in mid-1940 to reinforce the Mediterranean Fleet. Despite an awareness that shipping was vital, the Japanese military seriously underestimated the (eventual) threat from Allied submarines. This overconfidence was reinforced by the ineffectiveness of Allied submarines in the early part of the war. Anti-submarine warfare was accorded a low priority and few warships and aircraft were allocated to protecting merchant shipping. Japanese destroyers formed the bulk of convoy protection; they had impressive night fighting capabilities, but had deficiencies in sonar and radar compared to equivalents of other navies. Moreover, Japanese Navy doctrine in relation to commerce defense was very bad. The size and effectiveness of the Allied submarine force increased greatly during the Pacific War. The U.S. increased production of modern submarines from 1942 onward. The efforts of Admiral Charles A. Lockwood were crucial for the rectification of the Mark 14's problems (which were nevertheless not resolved until September 1943). He also selected more aggressive submarine skippers. Signals intelligence broke the "maru code" in January 1943, after a gaffe by U.S. Customs pre-war had caused Japan to change it. American aircraft engaged in aerial minelaying in Operation Starvation. As a result of all of these developments, U.S. submarines inflicted devastating losses on Japanese merchant shipping in 1943 and 1944, and by January 1945 had effectively destroyed the Japanese merchant fleet. In a break with pre-war doctrine (which, like Japan's, had presumed a rush across the Pacific and a "decisive battle" between battleships), with the London Naval Treaty, and with long-standing U.S. defense of freedom of the seas, U.S. naval commanders in the Pacific were ordered by the U.S. Navy Chief of Staff to "execute unrestricted air and submarine warfare against Japan" on the afternoon of 7 December 1941, six hours after the Japanese attack. This order authorized all U.S. submarines in the Pacific to attack and sink any warship, commercial vessel, or civilian passenger ship flying the Japanese flag, without warning. Thomas C. Hart, commander in chief, U.S. Asiatic Fleet, issued the same order at 03:45 Manila time (09:15 in Hawaii, 14:45 in DC) on his own initiative (but knowing U.S. Navy Chief of Operations Harold "Betty" Stark intended to do so). The Pacific Fleet submarine force had emerged unscathed from the attack on Pearl Harbor and USS Gudgeon departed on the fleet's first offensive war patrol on 11 December. The Asiatic Fleet's 27 submarines (including more fleet boats than at Pearl Harbor) also went into action on the first day of U.S. involvement in the war, beginning war patrols in the waters around the Philippines and Indochina. 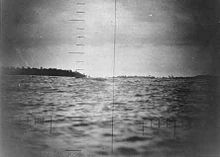 Due to inadequate prewar planning, which made no provision for defensive minelaying, nor for placing submarines on station around the Philippines, nor off enemy harbors, the Asiatic Fleet's efforts to counter the Japanese invasion of the Philippines were unsuccessful and the fleet's surviving submarines were forced to withdraw to Surabaya in the Dutch East Indies (DEI). In 1943, U.S. Congressman Andrew J. May revealed the fact that Japanese depth charges were not set deep enough to destroy U.S. submarines. Japanese anti-submarine warfare grew in effectiveness, particularly after the debut of radar in the IJN. Different sources provide varying figures for the size of the Japanese merchant marine and its wartime losses. In addition to taking a heavy toll on Japan's merchant shipping, a large number of troop-ships were also sunk. This resulted in the loss of thousands of Japanese troops, who were being transported to bolster Japan's already declining manpower on land in the final years of the war. 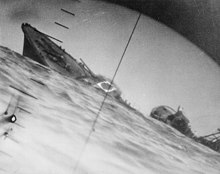 Allied submarines sank an estimated 35 troopships with more than 1,000 casualties. The threat of submarine attack seriously hampered the ability of the Japanese Army to move troops. Unfortunately Allied submarines also sank a number of hell ships, which were transporting Allied POWs and Romusha slave labourers. It is estimated that 10,800 POWs died at sea. Most of these deaths were the result of an allied submarine attack. Donald L. Miller has estimated the loss of life among POWs was twice that, asserting "approximately 21,000 Allied POWs died at sea, about 19,000 of them killed by friendly fire." ^ a b Euan Graham (2006). Japan's sea lane security, 1940–2004: a matter of life and death?. Routledge. ISBN 978-0-415-35640-4. ^ Blair, Clay, Jr. Silent Victory (Bantam, 1947), pp.508, 521–2, 568, 574, 576, 609, 646, 724, 745–6, 784, 806, 818, 825, 827, 829, 842, 865–6, & 868–9. ^ a b Holwitt, p.6. ^ Mars (1971), pg 27, 62 and 64. ^ Mars (1971), pg 212. ^ "Dutch submarines in Australian waters". Allies in Adversity. Australia and the Dutch in the Pacific War. Australian War Memorial. 2006. Retrieved 2008-06-08. ^ Parillo (1993), pg 37–38. ^ a b Blair, Silent Victory, p.439. ^ Blair, Silent Victory, pp.361, 553, & passim. ^ Blair, Silent Victory, p.156. ^ Blair, Silent Victory, pp.361 & 551. ^ Blair, Silent Victory, pp.509 et al..
^ Parillo (1993), pg 63–73. ^ Parillo; Peattie & Evans, Kaigun. ^ Blair; Farago, Broken Seal. ^ Blair, pp.819 & 967ff. ^ Tullibee to the Mk14, Tang to the Mk18, both from circular runs; given the prevalence of circulars, there were probably others. Blair, Silent Victory. ^ Not counting those lost to friendly fire, stranding, accidents, and known losses to circular runs, nor those lost in the Atlantic, which account for the rest. Blair, Silent Victory, pp.991–92. ^ Miller, Edward S. (1991). War Plan Orange: The U.S. Strategy to Defeat Japan, 1897–1945. Annapolis, MD: United States Naval Institute Press. ^ a b Blair, Silent Victory. ^ Willmott, H. P. Barrier and the Javelin? ^ Blair, Silent Victory, pp.157–158. ^ Blair, Silent Victory, pp.156–8. ^ "IJN KIRISHIMA: Tabular Record of Movement". Senkan!. combinedfleet.com. 2006. Archived from the original on 10 June 2007. Retrieved 2007-06-06. ^ Lord, Incredible Victory p. 213; Parshall & Tully, Shattered Sword, pp.302–303. ^ Parillo (1993), pg 242. ^ Blair, pp.360, 552, 816, 878, 970, 975, 977, 979, 980, & 982. ^ Blair, pp.308–9. This had unintended consequences, drawing Japanese attention to the weak defenses, which were strengthened when the U.S. invaded the atoll in November 1943. ^ Jones and Nunan (2005), pp.239–242. ^ Dönitz, Karl. Memoirs: Ten Years and Twenty Days. ^ Blair, passim;Judgement: Dönitz the Avalon Project at the Yale Law School. Poirier, Michel Thomas (1999). "Results of the American Pacific Submarine Campaign of World War II". Chief of Naval Operations Submarine Operations Division. Archived from the original on 2007-11-09. Retrieved 2008-06-07.